Rather than use the jib sail as part of the mast support (as done by the manufacturer), a separate forestay provides a much stronger and reliable structure. Begin by removing the jib from the boat. Use an 0.036" (#63) bit to drill a hole in the mast top as shown in the drawing. Exact location is not important, as long as the hole is far enough from the edges and the other holes not to weaken the mast top. This is where the forestay will be attached. Next, measure and drill a 0.036" hole in the bow deck approximately 0.4" from the front and along the centerline, as shown in the picture. Drill the hole at a rearward-leaning angle that matches the line the forestay will make from the bow deck to the mast top. There is plenty of plastic mass in the bow to guarantee a strong attachment. Install a 1/4" screw eye in the hole, at the angle created when drilling the hole. Thread a piece of rigging string through the new 0.036" hole in the mast top, and tie a "TYPE A" knot. Install a line adjuster and a snap near the lower end of the forestay. Connect the snap to the screw eye and adjust the forestay tension to achieve the proper mast alignment (leaning slightly rearward to affect a slightly weather helm - very necessary for good tacking performance with the Victoria). 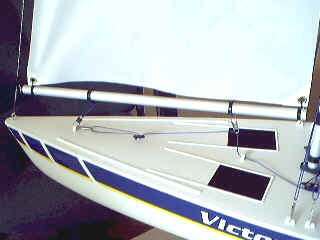 Adding a forestay requires a modification to the jib attachment and rigging. Refer to the picture at the right when making the modifications. 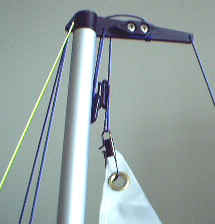 Use a "TYPE B" knot to secure one end of a piece of rigging string to a snap, and the other end to the forward-most jib boom ring. 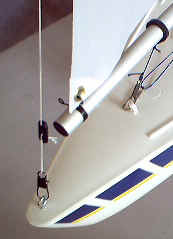 Adjust the rigging string for 1/2" to 3/4" between the jib boom ring and the snap. Position the jib boom ring approximately 3" back from the front of the jib boom. Attach the snap to the forward deck eyelet. Fine adjustments to the jib boom position is accomplished by sliding the jib boom ring back or forth. Use a "TYPE B" knot to secure one end of a piece of rigging string to a snap, and connect it to the top jib attachment point. Thread the rigging string through the mast spreader and install a line adjuster. Next run the rigging string up through the hole in the mast top closest to the boom, and use a "TYPE C" knot to secure the rigging string to the mast top cleat. Use the line adjuster to set enough tension on the jib sail to hold it in position. Thread the jib sheet (control line) from where it attaches to the mainsail sheet, through the bow eyelet in front of the mast and through a snap (attached to the rear jib boom ring). Install a line adjuster and another snap for attachment to the forward deck eyelet. Jib position adjustment is the same as the original configuration.